I was lucky enough to have some of my work featured in it. 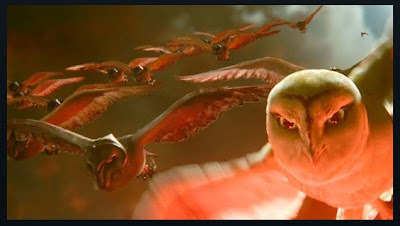 My shot from the previous trailer of an ominous group of owls makes a re-appearance ... but now the main character shouts "Get Them", and remarkably she does this without moving her lips! My other shots appear near the end when the cutting gets faster. I animated a large portion of a chase sequence for the film which you get a glimpse of here, in the first shot we see two owls bearing down on a blue bird. My next shot has been cut into two, in the first part we see the two owls from the previous shot collide. Then after the cut, one of the owls reaches forward about to grasp the bird. Look out for the trailer in cinemas. It will be playing in 2D and 3D in front of Toy Story 3 which will be released in the US on June 18, and in Australia on June 24.